I hope you all are having a lovely extended Memorial Day weekend. This federal holiday isn't just about cook-outs and the start of summer vacation; it is a day for honoring those who have died during military service. 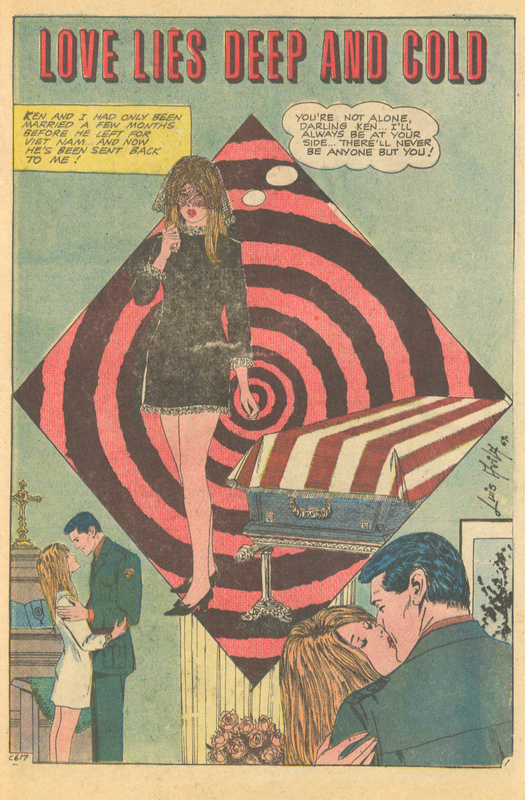 In recognition of this day of remembrance, I have for you a story called "Love Lies Deep and Cold" from Charlton's Time for Love #16 (May 1970). Story art is by Luis Avila. In the moving splash page, we learn that newlywed Leah has just lost her husband, Ken. One of the unlucky ones, he was killed while serving in Vietnam. Ken is given a full military burial. After the funeral, Leah goes back to the home they shared -- almost expecting for Ken to come bursting through the door as if nothing had happened at all. One morning, Leah's neighbor Ben Tibbs comes to the door looking for bandages for his mangled hand. He fought in Vietnam too, but made it home alive. Tragically, when Ben came home from war, he was notified his fiancée had been killed in an accident. That night after meeting Ben and while lying in bed, Leah thinks about Ben's tragedy and is deeply saddened. Clearly she is suffering from depression as she thinks to herself, "What a rotten life... I wish I were dead!" Finally, she decides she cannot fall asleep and ruminates between taking sleeping pills or going for a walk. She decides to go on a walk to avoid having her usual nightmares. She goes by the river and leans over the edge of the bridge and contemplates jumping. She is stopped from acting on her impulses by the sudden appearance of Ben Tibbs, her neighbor. Having taken a vow that she would never date again, Leah tells him to leave her alone and stop interfering with her life. Ben retreats, until out of nowhere a couple of strange men emerge from the shadows and start to attack her. Ben Tibbs hears her screams and comes to her aid. After beating up the attackers together (yup, Leah clunks one on the back of the head with her shoe), Leah feels a little better about spending time with Ben. Soon, he starts running errands for her and she starts cooking meals for him. Before long, they even attend a movie together. Leah appreciates his company, but decides it is best to keep her distance for fear of falling in love with him. Leah successfully ignores Ben, until one night she smells smoke in their apartment complex. Leah scrambles to notify Ben. Once both are safe from the smoke and flames, they admit their love for one another and Ben asks Leah to marry him. In spite of her vow to never love again, she says yes. Despite her best efforts to run from love, Leah surrenders to it -- obviously moved by Ben's own tragic past. Kind of a bittersweet story, but I appreciate the unexpected grooviness of Avila's artwork and Charlton's acknowledgment of the hardships of war. Time Travel Tuesdays - Dr. Wertham Speaks Out on Romance Comics!